The DC Health Care Safety Net Alliance program provides health insurance to low-income residents of the District who are not eligible for Medicaid due to strict federal restrictions on immigrant eligibility for federally funded public benefits. Although Alliance provides critical, life-saving services, the DC Department of Health Care Finance (DHCF) adopted a harmful policy in 2011 requiring all beneficiaries to complete an in-person, face-to-face interview every six months in order to keep their coverage. These requirements are so onerous because DC Department of Human Services (DHS) service centers where beneficiaries recertify cannot accommodate the sheer number of Alliance beneficiaries who need to come in to renew their coverage. Our clients battle extremely long lines and wait times when they attempt to recertify their coverage at DHS service centers. Legal Aid has been monitoring the length of lines and wait times at the service centers since 2014. In October and November 2018, pro bono partners coordinating with Legal Aid made 16 visits to DHS Service Centers and found that customers routinely reported arriving as early as 4:00 or 4:30 a.m. (with some arriving as early as 2:45 a.m.) and waiting outside for hours before the service centers doors open. Customers have to do this because if they do not, they risk being turned away when the service centers reach capacity for the day. 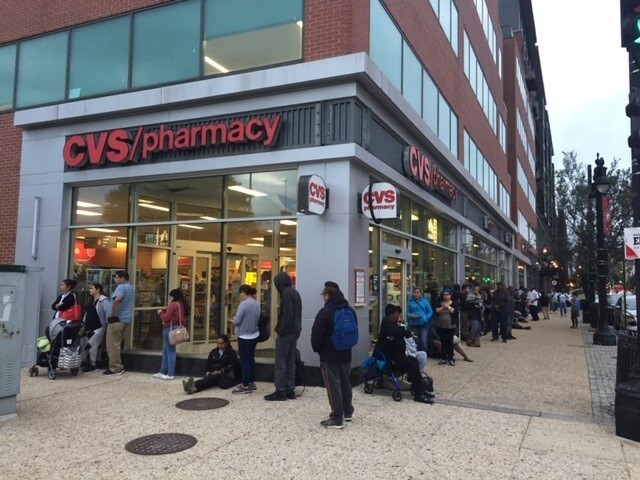 Line at the H Street Service Center on October 5, 2018 at 7:00 a.m.
First person in line arrived at 3:00 a.m. These long wait times make it extraordinarily difficult for even the most dedicated Alliance beneficiaries to successfully recertify and retain their coverage. DCFPI’s report explains that these onerous recertification requirements increase the Alliance program’s costs by confining the program largely to the sickest beneficiaries, who struggle to overcome long lines and wait times at the service centers because they must maintain essential health coverage. And, when beneficiaries lose their coverage for even short periods of time due to barriers to recertification, they often go without necessary preventative care in the interim, causing their health care costs to be significantly higher (and their own health significantly worse) when they return to the Alliance program. In 2017, the DC Council passed legislation to repeal the current six-month, in-person recertification requirement, but funding hasn’t been allocated to implement it. In February, Legal Aid testified at the performance oversight hearings for both DHCF and DHS and urged the Council and Mayor Bowser to work together to fully fund the Act for FY 2020. The upcoming FY 2020 budget gives Mayor Bowser and the Council the opportunity to fulfill the District’s commitment to providing health insurance to our immigrant communities by removing these onerous recertification requirements.